Love this post from Unabridged Bookstore: "This memoir about Garrard's time spent in an Ex-Gay camp in Arkansas will disarm you with its candid vulnerability and gut you with both its beauty and its horror. An important, absolutely captivating read." Here's my latest article, in VICE: "The lie on offer from this year's iteration of the Republican Party is that freedom exists in a vacuum, that everyone in our country has complete access to freedom at all times, and that safety is a matter of personal choice." My piece is up at TIME now. The GOP's introduction of language supporting conversion therapy is extremely dangerous. Help spread the word. A very summery Instagram account just paired my book with ice cream from the Big Gay Ice Cream Shop. Although the idea of melting ice cream on my book jacket made me cringe at first, I'm into it now. Here's my The Rumpus interview with Deirdre Sugiuchi, who was sent to an evangelical reform school in the Dominican Republic at the age of fifteen. A fascinating talk. 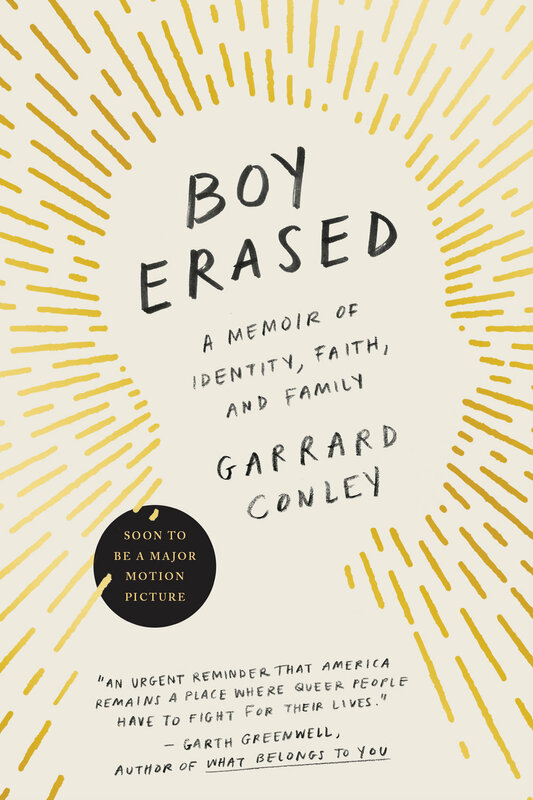 "Boy Erased is not an expose, not a self-help book or sentimentally sensational tell-all. Instead, it is a nuanced, sharply written work of art. Conley’s prose is evocative and lush, allowing the reader to understand the confusion and frustration endured, not only by him, but also his mother and father whom, ultimately, regrettably, thought they were doing the right thing." I compiled a list of LGBTQ books for Penguin Random House in honor of Pride Month. Garth Greenwell & I have issued a statement about visiting NC indie bookstores in the midst of anti-LGBT legislature. My piece is up at Lit Hub. In it, I explore how the tired narratives I encountered in 'ex-gay' therapy made me explore stronger, more nuanced narratives. I'm a better writer because of it. I have an article out on CNN Opinion about 'ex-gay' therapy, HB2 in North Carolina, and safe spaces. Publisher's Weekly has included BOY ERASED in their Books of the Week. So thrilled! Click here to join my campaign to raise awareness on this issue. For full dates (including fall), click here. My essay, "Safety Rope," is in many ways a prequel to the events in BOY ERASED, an accounting for what later happens to our family when I'm sent to 'ex-gay' therapy, so it's fitting, I think, that this piece is out one week before the book. The Book Tour is now up. I'm excited to be visiting so many cities I love: New York, San Francisco, Seattle, Little Rock (yes, even Little Rock!). I hope I get to see you along the way. The first chapter of BOY ERASED has been published in the Virginia Quarterly Review.